Meteor House » Three Announcements in Three Days – Part One! Three Announcements in Three Days – Part One! 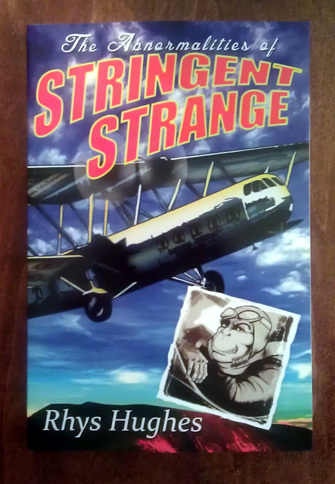 As of today, all preordered copies of The Abnormalities of Stringent Strange, by Rhys Hughes, have been mailed! After many delays we settled upon a Signed Limited Edition of 88 copies. And for no reason other than Rhys wanted to, each copy has been named after one of the 88 Constellations! We have a few signed/constellationed copies left, but we don’t expect them to last very long, so get one while you can. Still on the fence about whether or not you want grab a copy of what—at only 88 copies—is bound to become a rare collector’s item? Check out this gestalt real-time review in two parts by Des Lewis: Part One and Part Two. Or reread this previous review by Dave Brzeski from The British Fantasy Society. And if you missed it before, Christopher Paul Carey interviewed Rhys Hughes about the book at SF Signal. Before we end this love fest let’s take a moment to comment on the cover art by Keith Howell. We’ve always thought the cover looked great on a computer screen. But live and in person, this cover is gorgeous! It jumps out at you from across the room! So this is it, possibly your last chance to get a Signed Limited Edition copy of this brilliantly weird comical metafictional romp. Grab one now while you still can! Comments Off on Three Announcements in Three Days – Part One!